Finding a legitimate snap of cold weather in the last 20 years has been difficult. A warming climate as a background signal certainly hasn’t helped. January 2004 was the 5th coldest January on record with a mean temperature of 18.7º at Bradley. Impressive! Here’s how the month shaped up across the hemisphere with a huge ridge bridge from Baffin Bay to the Bering Strait. 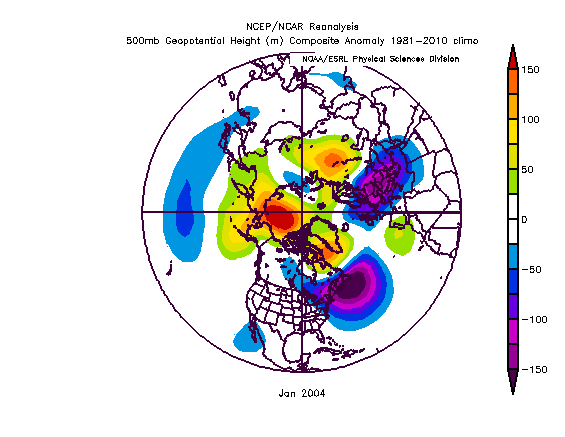 All of that ridging and blocking over the high latitudes produced a super-cold month in New England. You could find ice floating in Long Island Sound! The most “brutal” day was January 14th with a high of 11 and low of -4. 850mb temperatures flirted with -25ºC all day along the Massachusetts border! That’s a -26ºF wind chill! There certainly have been colder days here in Connecticut (see here for the records) but some of the days in January 2004 were impressive. All of the cold occurred with virtually no storminess and no snow on the ground. High oil bills and nothing to shovel. What a disaster. For the weather freaks loving the site of getting some big cold into the United States I urge caution! Not all cold and blocky patterns are snowy patterns. A suppressed or quiet storm track can be unpleasant. The cold’s coming into the lower 48 – now we just need to get the storms. Update: I would be remiss if I didn’t include the Christmas Day 1980 cold which was undoubtedly one of the most memorable Arctic outbreaks in New England (probably the coldest day since the 60s in many areas). Temperatures never made it above 0 during the day (high was at midnight that morning) and wind chills around morning were around -35F. 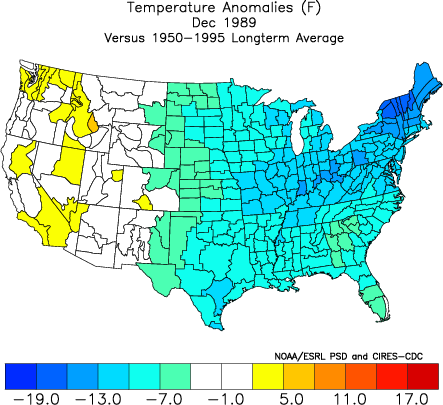 There may be no monthly temperature record in southern New England as impressive as the December 1989 Arctic outbreak. It was epic. It was a relentless assault of cold! At Bradley, the daily high temperature was below average every single day. The daily low temperature was at or below average every day except for the 31st. Looking back in the record books the average monthly temperature was 18.1º which is a full 13.5º below average. December 1989 was the coldest December on record beating out the previous record holder, December 1917, by 2.7º. 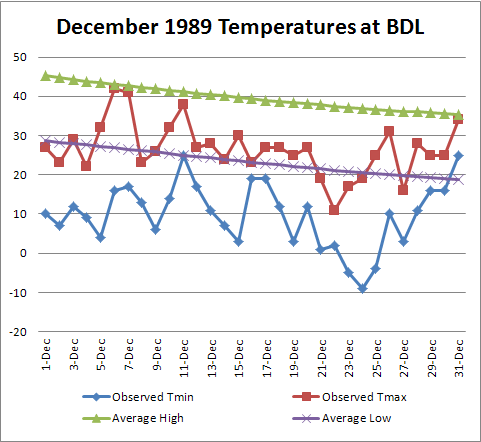 According to the 1981-2010 normals from NCDC the monthly average temperature in December is 31.6º at BDL with a standard deviation of 4.2º. December 1989 was a full 3.2 standard deviations below normal (assuming a normal distribution that means the cumulative probability for a monthly December average temperature <18.1º is 0.065%). It wasn’t just Connecticut. Across northern New England the anomalies were even more impressive! Significantly below normal temperatures stretched from Texas to North Dakota and east to Maine and Florida. While December and January feature the largest variance in temperature of any month in Connecticut (largest standard deviation) the records in 1989 were quite extreme. In fact there was a 19 day stretch in December with sub-freezing temperatures at BDL which is the longest such stretch on record. The month is also the 7th coldest month on record which is quite a feat to accomplish in December – a full month before the climatological temperature minimum. So why did it get so cold? The 500mb anomaly for the month shows a very cold pattern. A few things jump out at me on this plot. One is the strong -EPO/+PNA pattern across the Pacific. 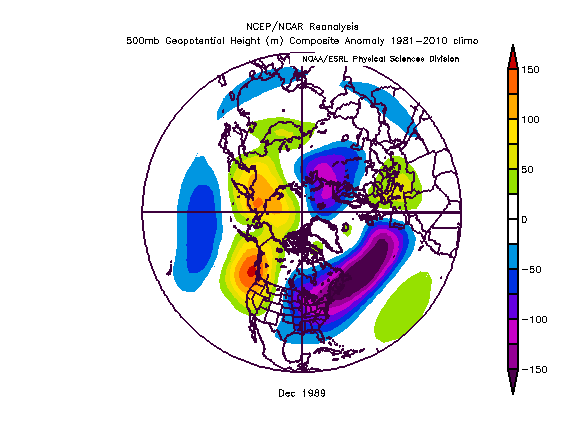 Positive height anomalies forced the Arctic Air off the top of the globe and down toward the U.S. The +PNA kept the cold east of the Rockies. What is interesting is a lack of a NAO signal and an only somewhat negative Arctic Oscillation. If you look at the progression from beginning to end of December you can see an initially powerful -NAO that began to retrograde toward Baffin Bay during the mid-month and by Christmas was replaced by a +NAO. Even so, the end of the month remained cold with snow on the ground and a flexing +PNA ridge that kept us in the ice box including a sub-zero morning low on Christmas (though not as cold as the record breaking 1980 bone chilling Christmas). Once New Years came the pattern flipped. And boy did it flip. January 1990 was was the 5th warmest January on record with a mean temperature of 34.7º or about 9 degrees above normal! December 1989 is likely the most extreme month we’ve seen temperature-wise. In a month known for large variations in average temperature from year-to-year the 3+ standard deviation in 1989 is remarkable. 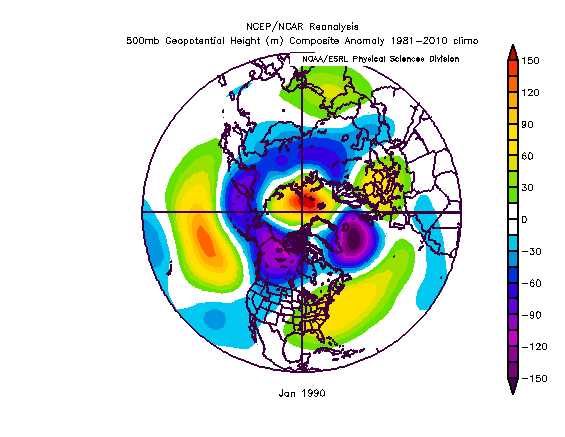 The hemispheric pattern evolved through the 31 days in a way that set the stage for a January torch. Pretty neat turnaround. My twitter pal Mark Boughton, the Mayor of Danbury, tweeted about some wintry precipitation this morning. MayorMark: Seeing a little frozen precipitation in Danbury. Radar agreed with his observation with a band of graupel or snow grains moving through Fairfield County. Mayor Mark is one my best weather watchers on twitter! Shortly after Mayor Boughton’s tweet this twitpic came across from Mount Snow. They should be able to get enough snow on the ground for a pretty decent start to the season in the next couple weeks. Enjoy today, it only gets colder by this weekend! 2 shots of colder than normal weather are heading to New England with a substantial warm up in between. Here’s the GFS MOS forecast for Windsor Locks over the next couple days. It looks reasonable to me and blends pretty well with the other computer models. The average low/high for today is 32/50 so you can see the next 3 days will be a couple degrees below normal and then we see a pretty substantial warm up by Tuesday and Wednesday. Across ski country in the Berkshires and Green Mountains the chill will be even more impressive with temperatures in the higher elevations struggling out of the 30s in Saturday, below freezing all day Sunday, and overnight lows in the teens. With low relative humidity and light winds on Sunday it should be fantastic snow making weather during the second part of the weekend and through the first half of Monday. 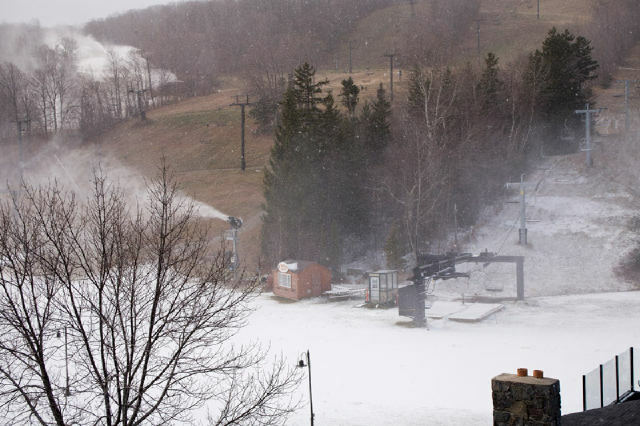 Obviously the 2-3 day surge of warmer air after this weekend won’t be pretty on the slopes. Even with some rain likely as well the pay off could be sweet. Today’s 12z GFS (valid 18z Thanksgiving) develops a very impressive nor’easter that straddles the coast of southern New England. For most areas in southern New England away from the coast this could produce a quick inch or two of snow or sleet followed by rain. 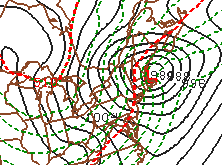 Up in the Green Mountains, however, a track like this could produce a wintry mix and decent snowfall totals. Before you get too excited, however, other models aren’t nearly as wintry. The European model keeps the storm much further west (which is much warmer) before the storm can redevelop off the New England coast. Still, there is a signal for some snow or sleet in the higher elevations of Vermont on Thanksgiving even with the “warmer” solution. If you have travel plans on Thanksgiving try to keep posted on this forecast. If you have ski plans after Thanksgiving cross your fingers because you may be in luck. Even if the natural stuff doesn’t wind up falling on Turkey Day the weather following Thursday should be the coldest so far this season with some great snow making days.